In a less tempestuous political climate, Ken Mandile's story would be a striking one. This year it is strikingly familiar. Mandile, the owner of a Massachusetts small business that manufactures high-precision screw-machine products, never nurtured political ambitions. But in March 2009, upset with the direction of the nascent Obama Administration, he registered on a website listing Tea Party events and began sending out e-mail blasts. The Worcester Tea Party, for whom Mandile serves as president, now counts more than 700 members on its distribution list, the vast majority of them political newcomers like Mandile himself. Groups like his have become the nexus of political disaffection, where deficit hawks, constitutional conservatives, federalists, birthers, senior citizens and others have united under the banners of smaller government, fiscal responsibility and free markets. Channeling frustration with the Obama Administration's policies into boisterous protests and fiery rhetoric has helped shape the national debate  and has likely provided a measure of catharsis as well. But with a new set of Tax Day protests looming, the Tea Party movement is nearing a tipping point. "Our biggest challenge," Mandile says, "is to get people to do more than come to rallies and sit at their computers trading e-mail stories." Swapping e-mails and toting signs has been pretty effective so far. The current of anger coursing through the Tea Party movement has been the loudest chord of opposition to the Obama Administration's agenda, and it has forced Democrats to spend more time than they'd like playing defense, even after a landmark health care reform victory. Over time, fuzzy depictions of the movement have grown sharper, and polls  like this week's USA Today/Gallup survey that found 28% of people identified themselves as Tea Party supporters, with 70% of those classifying themselves as conservative  have helped define the contours of a grass-roots faction that feels both parties have failed to hew to constitutional principles. What's less clear than the group's makeup is the role it will play in November's midterm elections and beyond. "The real test is whether it's an electoral phenomenon or a social-protest phenomenon," says Isaac Wood, an analyst at the University of Virginia's Center for Politics. "They've been very successful at garnering headlines. What they need to do is prove they can garner votes." Yet to do so entails diving into a political process whose perversion has been an organizing principle for the Tea Party. "They are kind of anti-politics, not just anti-government," Wood says. "They don't seem to be enthusiastic about doing politics the same old way." Nevertheless, many Tea Party activists are ready to trade headline-generating protests and bus tours for the unglamorous banalities that make campaigns hum. Jenny Beth Martin, national coordinator of the Tea Party Patriots and co-chair of the Atlanta Tea Party, says her group is teaching members how to set up phone banks in their homes, knock on doors to disseminate literature and spread the word about the movement's core values. Honey Marques, a full-time physician's assistant in Arizona, says she spends up to 40 hours per week in her capacity as president of the Tea Party Patriots of Scottsdale, which has divided itself into committees  including a finance team and a research and investigative unit  to spread its message and vet candidates. "We're trying to compete with the left. They've got a shotgun, and we've got a little BB gun," she says. "You're going to see a lot of these Tea Partyers mobilizing in the fall," predicts Ned Ryun, president of American Majority, a group that trains Tea Party organizations in tactics ranging from fundraising and campaign planning to social networking and voter registration. "They're fired up. They're going to do the grunt work and be the get-out-the-vote people." But some operatives seem to consider this a secondary goal. Instead of endorsing candidates, which would violate the 501(c)(4) stipulation that political campaigns not be such a group's primary purpose, activists like Mandile are taking the long view  preaching civic engagement and educating people about candidates' positions and constitutional principles. "I don't like to focus entirely on November. We're going to lose early battles, and we have lost some," he says. "We're encouraging change at the very local level  in cities, in towns." The goal, he adds, is to "create a farm team, so that four or six years from now, we have people with experience" who can mount credible campaigns themselves. 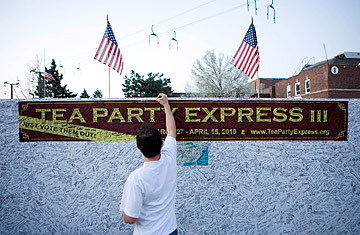 To pave the way for the candidates of the future, the Tea Party has to maintain its character as it swells in size. "One of the biggest challenges for the coordinators of Tea Party Patriots is keeping the grass-roots integrity of this movement," says Martin. "There is a fine line you have to walk. There are so many people interested in what we're doing, and we have to have a structure in place to support those people." Yet others believe building such structures could blunt a phenomenon whose power seems to flow from its inchoate nature. "Too much structure and organization is a negative thing when you're trying to work at the local level," says Mandile, who urges groups in his area to subdivide rather than balloon into something unwieldy. These sorts of decisions are part of the maturation process Tea Party veterans are trying to navigate. "There are phases people go through. They come to the Tea Party, they're angry, they're hysterical, they're panicked, and they need someone to tell [them] what to do to fix all this," says Christen Varley of the Boston Tea Party. "We have to talk them off the ledge and bring them around to understand that they have a role and a responsibility." Varley, 40, is a smart, fast-talking woman who knows that winning a competitive game requires mastering its rules. "People want to change the system. They want less government involvement," she says. "But they need to understand how it works right now. We can't just stand outside the Capitol shouting at people. We have to go about it a different way." For Varley, that means learning how to lobby, recruiting candidates and distributing questionnaires that clarify candidates' positions. "Political parties exist to win votes for people," she says. "The Tea Party should exist to win votes for principles." Those principles are increasingly well-defined. Whether the party can win the votes to support them is a murkier matter. Martin and Mandile dismiss notions of a Tea Party purity test for candidates, and mainstream Republicans are trumpeting the movement's potential boost to the GOP in November. "I think they're going to be enormously influential," says Pete Wehner, a former Reagan and George H.W. Bush Administration official who is a senior fellow at the Ethics and Public Policy Center in Washington. "I don't get a sense that this flame is going to be dimmed much." But Republicans know they have to work hard to win over Tea Party members, who have repeatedly expressed their disgust with members of both parties. The goal of educating the public, Varley says, is not merely to help usher electable conservatives into office. "If it was to pick candidates to win, then we'd just be the RNC all over again," she says. "Their track record isn't that good anyway." See "Why the Tea Party Movement Matters."